I know. The thought of it brings me out in cold sweats too. If this trend really reemerges in full force, does this mean us mere mortals will have to sport it too? If so, how will we cope? And should we start looking into facial surgery costs just in case? My round face and abnormally shaped head (we'll not get into that now) were not destined for the buzz of the razor. So hopefully this trend will stay amongst the genetically blessed, elite model crew where it belongs. 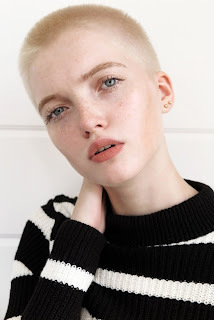 Originally a bold punk statement commonplace in the 1980s, this reemergence of the buzzcut on us lady folk seems to be apart of the ever-growing trend for androgyny. And I'm a fan. Personally I'm still not over Natalie Portman's 90s buzzcut, and Amber Rose has been rocking hers, un-phased, for years. But recently someone has appeared to rival both of these buzzcut patrons. And her name is Ruth Bell. Half of the modelling power duo with twin May, Ruth headed for the razor to contrast with her sister's ethereal locks. And she does it with such effortlessness and complete beauty that she almost convinces you that, yes you too would look brilliant bald. Almost. I have to admit, I have spent hours googling Ruth Bell and her infamous scalp. Stalking the twins on every social media platform, and scraping my hair tightly back in the shower just to double check if I could pull it off too. The answer is no. But I will continue to wish that I was blessed enough to be able to wear this hairstyle for the rest of my life. If wearing your boyfriend's jacket is cool, then wearing his hairstyle is surely the coolest thing you could do.